3D printing technologies are challenging plant teams to rethink conventional approaches to design, tooling, and inventory. The Plant Services 2015 Disruptive Technology series is a quarterly look at technology innovations that are generating rapid changes in how plant managers and engineers approach their jobs. The series launches with a look at the intersection of 3D printing and industrial manufacturing. For a technology that was developed in the 1980s, 3D printing took its time to arrive in the general marketplace. Advances in the wider worlds of scanning and additive manufacturing have recently propelled 3D printing beyond hobbyist awareness, and are leaving lasting marks in the worlds of aerospace, automotive, and medicine. These technologies are now gaining a firm toehold in manufacturing. In a recent survey by PricewaterhouseCoopers, 67% of surveyed manufacturers said that they are currently implementing 3D printing in some way, with 25% more indicating that they plan on adopting it in the future. The market numbers support these trends: the global market for 3D printing services and materials was estimated by Canalys to be $3.8 billion in 2014 and is projected to increase to $16.2 billion by 2018, for a compound annual growth rate (CAGR) of 45.7%. IBISWorld estimates the U.S. share of that market at $1.8 billion, with a projected CAGR of 15.7% over the same time period. For this story, the first in our disruptive technology series, Plant Services interviewed several figures involved with 3D printing to get their thoughts on why 3D printing is on the rise in industrial manufacturing, as well as the kinds of benefits that plant teams are already seeing from their engagement with these technologies. Who is a good candidate for these technologies? "If someone has a special device they need for their manufacturing floor, their plant, or their lab, you can 3D print something that you can’t manufacture," says Bruce Bradshaw, VP Marketing, North America at Stratasys. "You can print 10 different versions, all slightly different, to find out which one’s going to work best for what you need. Now you just need to decide which printing technology to use." Stratasys deploys two distinct technologies – Fused Deposition Modeling, or FDM, which prints using thermoplastic materials; and PolyJet, which uses photopolymers – depending on the customer application and materials requirements. "FDM prints using real-world plastics, the same ones found in your phone, laptop, airline interiors," says Bradshaw. "So if I’m doing an end-use part, I have the advantage of using the same material off my 3D printer that I’m going to use in my traditional manufacturing process, so it will react in the same way as my end-use part in a functional testing issue." When it comes to simulating the real look and feel of an end-use part, Bradshaw says that the PolyJet technology will deliver smoother surfaces and thinner layer lines, as it can print in a much higher resolution (see Figure 1). "The other thing that PolyJet allow us to do is blend multi-materials all within a single print. For example, if I want to do an overmold of a gasket and a frame, I could print those at exactly the same time, as many as 27 different material properties, printed at exactly the same time in the same part." One of the newest alternatives to conventional metals and thermoplastics printing is the Ultrasonic Additive Manufacturing (UAM) process. Developed by Fabrisonic, this process takes thin metal foils on the order of 6 to 10 thousandths of an inch thick and typically 1 inch wide, and ultrasonically welds those together in a brick-laying pattern to build up a near-net-shape item. "All of our machines are actually 3-axis CNC mills," says Mark Norfolk, President at Fabrisonic, "so we use the additive piece to get near-net shape, and the subtractive piece to get the exact-fit finished tolerance that you need out of the part. We’re welding with ultrasound, which is unique to our process and which happens essentially at room temperature, so we don’t have to worry about a lot of metallurgical interactions." The solid-state nature of the final printed product is a key advantage of the UAM process, as it bonds dissimilar metals without creating brittle inter-metallics (see Figure 2), and enables the embedding of electronic components including microprocessors, sensors, and telemetry into solid metal parts. "For example, in aluminums, we see peak temperatures in the range of 200 °F, so we’re not changing the metal at all," says Norfolk. "We can also combine dissimilar materials since we’re doing this at so low a temperature. Taking ultrasound and vibrating the metals back and forth and essentially scrubbing off the oxide layer, with a little bit of temperature and a little bit of pressure, we get a solid-state metallurgical bond." Industrial teams are taking increasing advantage of the wide range of additive manufacturing technologies to drive lean improvements in their processes, from design and tooling to inventory. “We are seeing a huge impact for companies in the manufacturing space to use 3D printing to print tooling, jigs, and fixtures,” says Bradshaw, whose teams have found that manufacturers using FDM 3D printers to create custom tools often experience lead time reduction from 40 to 90 percent. Terry Morey, Engineering Manager at Fluke, shares that while they’ve been using 3D printing for industrial design since the eighties, using it for manufacturing production is relatively new to the company, and they're already seeing benefits for tooling. 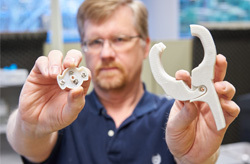 "Especially when a legacy apparatus is nearing end of life, we can use 3D printing to design a replacement tooling component for a manufacturing line, using printed plastic, and test it out," says Morey. "We also use it to create components for the manufacturing process that allow us to do things that traditional machining can’t do, such as designing a 3D insert to aid cooling within a plastic molded component." 3D Printing and the New Shape of Industrial Manufacturing. PricewaterhouseCoopers LLP, 2014. 3D Printing Jigs, Fixtures, and Other Manufacturing Tools. Stratasys, 2011. That usefulness extends beyond tooling and into making assembly fixtures. Fluke builds test fixtures–or nests–to hold a part in a certain way for testing. Before 3D printers, those nests took a couple of weeks to build in the machine shop. “Today we send a file to 3D printing and the next day we’ll have a fixture in hand,” says Jeff Worones, Mechanical Engineer at Fluke. And, because each design iteration can be produced quickly and for a minimal cost, it is more practical to explore more concepts and refine those initial concepts before presenting them. A final application on the maintenance side is reverse engineering of unavailable or otherwise legacy parts. "We certainly have good market penetration into industries that need replacement parts, mostly for complex shapes where the original part manufacturer is no longer around or there never was any manufacturing data", says Dan Perreault, President & CEO at NeoMetrix Technologies, Inc. "It’s the case where there’s the last part on the shelf. We can’t get any more. Now what do we do?" "Using 3D scanning technology is a great way to get an accurate representation of your part and use it as a start point to recreate your new part," claims François Leclerc, Product Manager at Creaform. "People often want to restore something that’s no longer available or that was made a long time ago and nobody is making nowadays." "Reverse engineering has played a large role for companies that don't have CAD for legacy parts they need to re-make, agrees Joe Montross, Application Engineer at Capture 3D. "The accurate and clean scan data you get has played a very big role in helping satisfy customers and bring down the cost to make those parts." Once the 3D file is on hand, plant teams may have the option to reduce physical inventory, and may even update their processes to accommodate digital inventory strategies. “If there’s a very low-volume, high-complexity product, it makes sense to design it with 3D printing in mind, so that you can 3D print the components on demand rather than keeping inventory around for something that doesn’t get built very often,” says Fluke's Morey. "Yes, digital archiving is extremely interesting in terms of applications," adds Leclerc. "There are some applications where I’ve seen customers store very bulky patterns on the shelf just to keep them for future reference in case they had to make something out of them. Coming up with a way to digitize them and keep them without having to keep the actual pattern or shape of an object is extremely convenient." Stratasys' Bradshaw suggests that lack of familiarity with AM technologies can cause some maintenance professionals to think twice before engaging with 3D printing. "The person who runs the plant floor is thinking, if I start to use a 3D printed part, what’s the liability of that?" says Bradshaw. "What happens if it goes down? If it goes down for four days and manufacturing is halted, these folks know conventionally what happens, but not always with the 3D printer side, so they are hesitant to invest because they could potentially have an issue on the manufacturing floor and not know how to fix it. However, as we’ve seen with hundreds of customers, manufacturers can integrate 3D printing at different levels and mitigate risk depending on their own environment." Fluke's Morey concurs, to a degree: "It’s risky because it’s new technology and our quality and productivity rests on it, so we implement carefully." Another source of hesitation centers on cost – specifically, the cost of using AM technologies where traditional process would be a better fit. "Today, with additive manufacturing costs, the cost per part is still higher than traditionally manufactured parts," says NeoMetrix' Perreault. "And the material properties are not necessarily as robust as traditionally manufactured parts, but that is changing. As this technology matures, the material properties are getting better, and as we all know the cost of technology over time goes down." Ultimately, Creaform's Leclerc sees inspiration in the forward momentum behind both 3D printing and 3D scanning. "We as the human race are very smart and will exploit whatever means of technology that’s available to us," says Leclerc. "You give people a set of tools, and they will get creative with them." 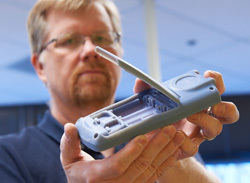 An example of how 3D printing helps a manufacturer develop innovative products more quickly and cost effectively was Fluke's introduction of the CNX Wireless Test product line in 2013. The Fluke Industrial Design (ID) group developed several design concepts before narrowing them down to three unique concepts that were printed on Fluke’s ZCorp 650 3D printer, made by 3D Systems, followed by four iterations of the selected design. The ZCorp printer uses a powder-based material that can be cornstarch or plaster powder, and these less expensive printing consumables allow the industrial designers freedom to print out parts for review more often than traditional (see Figure 1). Both ID and mechanical engineers used that first version to analyze how the module fit in the hand and how accessible the buttons were. That concept model was also taken to customers to get feedback on the overall form and size. “Printing that initial model only took about 15 hours, so it allowed us to get something out to talk with customers about really quickly,” says Jeff Worones, Fluke Mechanical Engineer. Armed with input on the concept from customers and mechanical engineering, the ID group went to work developing a feasible design including the change of several button locations and an increase in size to make sure that all the components would fit in the case. Once that design was approved by the project team, the files were sent to Fluke’s Eden 350V printer, made by Stratasys, which prints in resin to deliver smoother surfaces and thinner layer lines for a more real look and feel of the end-use part (see Figure 2). The new plastic parts, keypad, and the PCB were printed individually on the Eden (they are the longest-lead items). On-hand samples of the metal parts and LCD were then assembled with the Eden parts. “With the Eden prototypes we could assemble all the components and see whether everything fit and whether the clearances were adequate before proceeding to tooling,” says Worones. That prototype was used for preliminary functional testing and by manufacturing to set up the assembly process, which helped minimize the adjustments when the product went into actual production. Fluke estimates that 3D prototyping shortened time to market for the CNX line. Even more important, the ability to quickly turn around updated prototypes based on input from customers helped improve the product. The response from electrical professionals to the final product culminated in the CNX Wireless Test toolset being named the EC&M 2013 Gold Product of the Year.